Massage Therapy Englewood, at 10906 E Winner Road, is the only place in the KC Metropolitan area where you can try and have regular sessions on the Sonic Life Total Body Vibration fitness machine, thanks to Sammy Coffman, the area’s exclusive dealer for Sonic Life. A wide range of health and fitness claims have been made about the benefits of sonic vibration, which is different than mechanical vibrating devices. 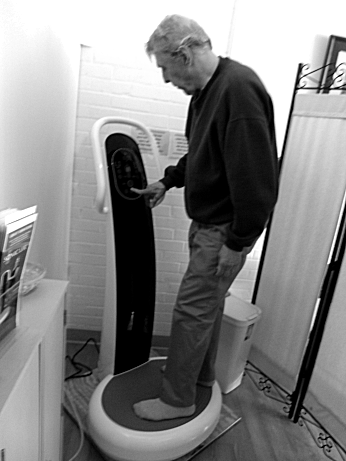 “Sonic vibration produces no friction and causes no stress,” said Sammy, comparing the Sonic Life machine to the kinds of mechanical vibrating fitness platforms that have been used for more than a century. The Sonic Life machine produces vibration through sound waves, with frequencies that can be adjusted to fit a particular need or desired outcome. Sonic Life’s manufacturer boasts that the machine can improve health and fitness, accelerate healing, improve circulation and bone density, as well as offering a wide-range of anti-aging effects “by stimulating all of the 100 trillion+ cells in your body with naturally resonant sound waves,” according to the company’s literature. For more information about the Sonic Life Total Body Vibration machine or to schedule a free trial, call Sammy Coffman at (816) 383-1232.